We are eight months into this thing called motherhood, Well for me motherhood round two as Ophelia is our second… so I guess technically 3 years and eight months into this. When I was pregnant with Jessamyn I really worried about bonding, I struggled to connect with her while I was pregnant and wondered if that was a sign I wouldn’t connect after she was born. That wasn’t the case, but I couldn’t help but have similar fears with Ophelia and wonder if I would even have time to bond with her while also chasing a three year old around and maintaining that relationship. One of the first things I remember from Ophelia’s birth is the way she smelled. I know that sounds kind of crazy, but I really remember that new born smell and the way I just wanted to hold her and protect her from everything for the rest of her life. I think that smell for whatever reason is tied to the way I bonded with her. Even now at eight months she still vaguely has it and I am taken back to that first day when I held her and knew she was a part of our family. 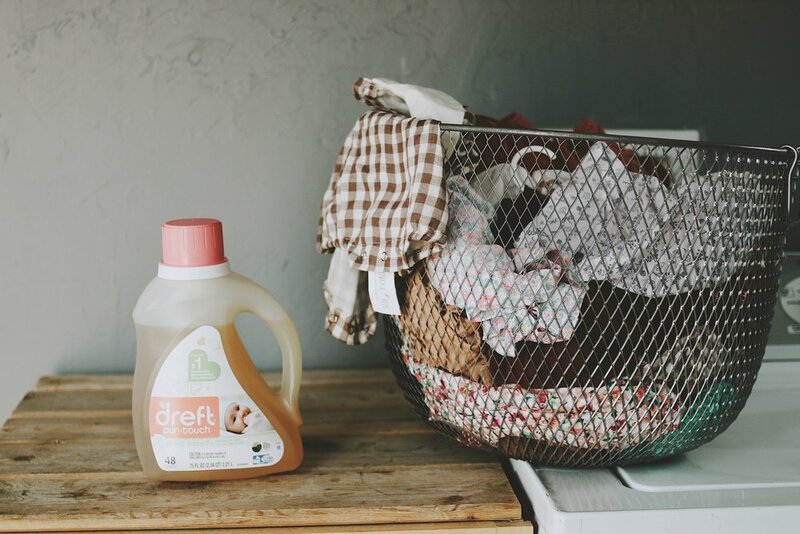 When Dreft reached out to me to collaborate on this blog post I was curious, we are pretty boring when it comes to laundry detergent. I just use the hypoallergenic detergent that comes in bulk and it works for all of us, no scent, no problems. SO when Dreft reached out and told me about Dreft purtouch, their 65% plant- based, hypoallergenic laundry detergent for baby, that is scented and that the iconic scent has been shown to helps parents feel more bonded with their babies, I was totally down for trying it. (ps. They sent us Dreft Purtouch which you can find HERE) We have been using it for about two weeks now and I have two things to say…. One it didn’t give me or the babies a rash which was a big deal for me because most scented products irritate my skin, but I have had zero issues with Dreft. Two, guys it smells like that new born baby smell, I am not even kidding. I pulled our random mismatched socks, and everything else you could imagine out of the wash to put in the dryer and I could not stop sniffing it. Like seriously the smell took me right back to the hospital and I might as well have been smelling Ophelia’s newborn head all over again. Even know just thinking about the baby detergent all I can think about is those first few days post partum and that beautiful haze that is the newborn days. In case you were wondering there is some fact to this! Dreft actually did a survey that showed 8 out of 10 parents feel that the smell of Dreft baby detergent makes them feel more bonded with their baby AND 94% of parents said that the scent of Dreft reminds them of babies… AND one more because this is a good one 87% said that when they were apart from their little ones the scent of Dreft helped them feel closer and more connected. So basically the smell is that good guys, it is really that good. I can’t believe I am saying this because I have always sworn off scented products like the plague, but this detergent is good and safe and hasn’t irritated or bothered myself or either of my babies. Honestly I will probably keep using Dreft even after they grow up because the connection between these baby days and this scent is so strong for me I am not sure I am going to be able to give it up. So no I am not telling you that our eight months of bonding is all due to laundry detergent, but yes I am saying this baby detergent can help parents with bonding and does smell basically like a new born baby. If motherhood has taught me anything, it is that these early days are so fleeting and especially with Ophelia not being my first born and having to chase after my three year old and seeing them both change and grow so fast… It has made me want to hang on to every moment I can. I will definitely be recommending Dreft to any and all moms I know as a newborn essential and I will continue to use it myself because if I can hang on to this time just a little bit longer, I am going to with both hands and every load of baby clothes… okay just kidding, but I mean we do a lot of laundry around here with two kids and if doing laundry can help me feel more bonded to my babies just by the scent I am totally in! Ps. What are your thoughts on baby detergent and bonding and what would you consider your newborn essentials when it comes to bonding?